Well, nothing is for certain, except for Daniel Day-Lewis and Anne Hathaway winning Oscars for Lincoln and Les Misérables, respectively, that is! Yes, other than that, one can’t be sure of who will win big at the Academy Awards next month. Let’s take a look back at the Screen Actors Guild Awards last night. It wasn’t a surprise that Day-Lewis and Hathaway won. The surprising winners were Jennifer Lawrence and Argo. Lawrence certainly deserved her Actor for Silver Linings Playbook, because her performance had more dimensions than award season frontrunner, Jessica Chastain’s did in Zero Dark Thirty or even Naomi Watts’ in The Impossible. That’s not to say that the latter two weren’t excellent. They were, but their roles weren’t as demanding, I feel (while Watts’ role was a little more demanding than Chastain’s). So I was happy when Lawrence’s name was announced, and it was good that she showed up, despite being ill. It sure proved to be a good decision. Now, in television, I was the happiest when DOWNTON ABBEY won big. I wouldn’t have been disappointed if HOMELAND had won, but something about season 2 of HOMELAND made me feel like it just wasn’t as great as season 1 was. In comparison, DOWNTON has been consistent throughout. Now judging the performances, HOMELAND’s Damian Lewis and Claire Danes deliver excellently, and Mandy Patinkin and the others are also very good, but the variety and the vastness of the performances in DOWNTON ABBEY definitely put it a notch higher. Those actors are so good that when I saw them together on stage at the SAGs, I thought, ‘How is Mrs Hughes making the speech? The servants should’ve been standing behind, while the Crawleys accepted the award up-front!’ But jokes aside, it was good to see them up there. They deserved it. Claire Danes’ win was no surprise. Her wins have made TV award shows a little less exciting now. Even she can predict that she’s going to win, given her expressions when her name is announced! Bryan Cranston deserved to win for BREAKING BAD, even though his subtlety as Walter White in the latest season pales in comparison to his performance in the earlier seasons. Still, if you consider it as a collective acknowledgement of his work on the show, it was well deserved. In comedy, there was no surprise with Alec Baldwin and Tina Fey winning their millionth Actors for 30 ROCK. But then again, if the Guild had to choose between awarding them and giving 30 ROCK the Actor for ensemble in a comedy, I think they made the right choice. After being irritated with the Guild for giving Baldwin the award every year, I finally made my peace with it. Maybe it’s good that they let him have a record of winning every year throughout the show’s seven-year run. 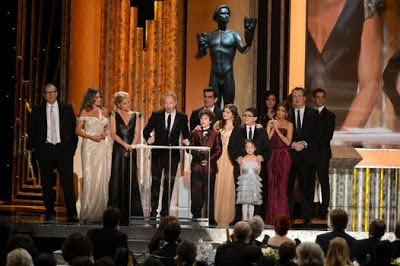 Of course, performances like Eric Stonetreet’s, Ty Burrell’s and Sofia Vergara’s (in MODERN FAMILY) might have gone un-rewarded in the individual categories, but the Guild more than made up for that by giving them Actors for ensemble in a comedy for a third consecutive time, despite the fact that both, 30 ROCK and THE OFFICE are ending this year. While the wins in miniseries or TV movie weren’t surprises either, I thought it was a good show. The presentations were good, especially Neil Patrick Harris and Amy Poehler’s. Their dramatic announcement of words was hilarious, especially when ‘mustard’ and ‘sandwich’ were among the mix. I also found Hugh Jackman and Anne Hathaway's presentation of Les Misérables, as a film nominated for outstanding ensemble, very funny, when they made references to Wolverine, Catwoman and Gladiator. 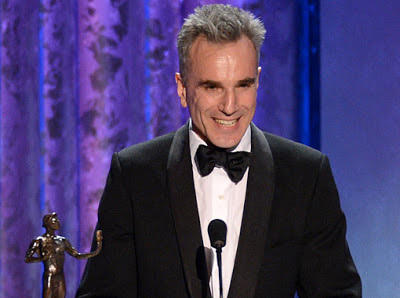 In the acceptance speeches, I personally liked Daniel Day-Lewis’, especially because of his point about actors bringing Lincoln back to life. 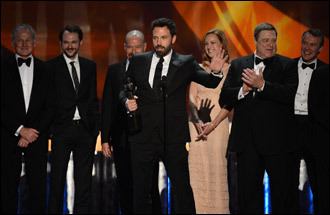 Ben Affleck did justice to everyone he wanted to thank in his speech, while Phyllis Logan’s speech, on behalf of the cast of DOWNTON ABBEY was endearing. 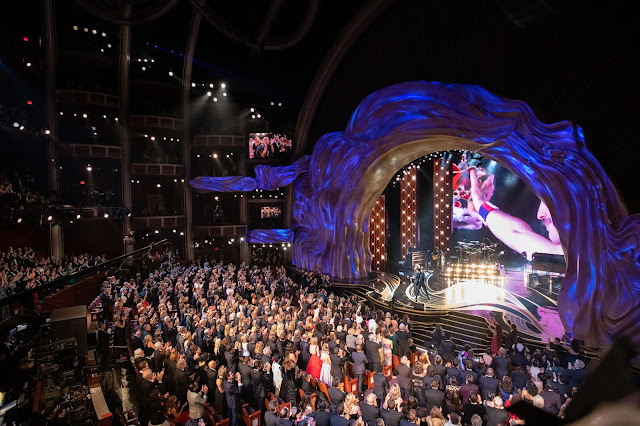 With only one more big award show (the BAFTAs) left before the award season finale, predicting the results of the Academy Awards this year has become tougher. But I will be attempting that soon, later, next month, so watch this space.